HOW​ ​DO WE​ ​ASSESS​ ​CREATIVE​ ​GRANT​ ​APPLICATIONS​? Applications are assessed on their individual merit anonymously at first, and then also against the other submissions with a simple scoring system. 1) Applications are presented anonymously – exactly as the applicants wrote them up so each project can be assessed purely on the strength of the idea and the thoroughness of the proposal. 2) Fellow grant applicants and members of the AfrikaBurn Art Committee review all of the applications which are displayed gallery-style at our HQ in Cape Town, as well as in Johannesburg, at a suitable venue as arranged by an ArtCom member. It’s important to remember that art at AfrikaBurn is not art in the classic sense, rather these projects are solidified representations of communal effort, radical expression and all the other good things. It’s not just about what they look like, it’s also about what they do. All Creative Grant applicants, including previous year’s grant applicants, and ArtCom, are involved in this part of the vetting process. The scores are tallied at the end of the assessment period and then ArtCom moves to step 4 of the process. Under this theme we consider whether the proposal is plainly funny, clever, beautiful, whimsical, interactive, new to Tankwa Town. ● Do I/we like it? ● Does it challenge barriers? ● Does it have a statement? ● Does it feel culturally significant? Under this theme we consider whether the proposal has considered its interaction and potential to engage audiences interactively at Tankwa Town. 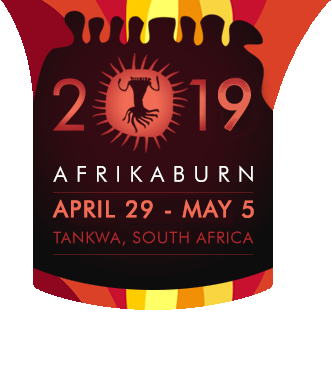 ● What impact will it have on the AfrikaBurn gathering and the cultural landscape (beyond AB) in general? ● What level of engagement/ interactivity does it invite? ● Is there a low barrier to participation?…i.e. parades, easy access for interaction and participation? Does it invite participation? Under this theme we consider whether the proposal shows a wider reach beyond the lifespan of the actual event in Tankwa Town. ● Will the project create new opportunities in its making or its inventing? ● Does it reach out? ● Is there a broader social contribution? ● Does the project leave anything behind? Infrastructure? Skills development? ● Can it be repurposed? ● Will it have a life after Tankwa Town? ● Will it generate new genres, audiences, debate? ● Does the project use waste materials to make the work? ● Is the method of putting it together inclusive and experimental? At this stage the names of the applicants is revealed. Under this theme we consider how likely the team is to successfully build what they have proposed. Previous successful track records at AfrikaBurn and other projects are considered. We look at the diversity of skills present in the team and if these align with the proposal, for example an architect, engineer, or set builder is likely to know how to construct large works. ● Are the skills necessary to make the project happen available? ● Does the timeline seem realistic? ● Is there sufficient organisational capacity? ● What is the delivery track record at AfrikaBurn and other events? ● Is it worth the risk to be able to develop new Collectives? ● Are there references and do they check out? 3) These scores are combined with the previous phase’s score, and collated, giving a final numeric score. 4) The high-scoring projects are identified and short-listed. 5) ArtCom begins the task of discussing all the projects in depth, and making a final list of projects. Detailed notes are made and fed back to projects via email. 6) The cost breakdowns of the shortlisted projects are assessed rigorously, and funds are provisionally allocated. At this point it may become necessary to reduce the number of projects that get an award, or to reduce the amount awarded to each project. 8) Once the awards have been determined, all applicants are contacted with the results of their application and any feedback there may be from the members of the Art Committee. ArtCom approaches unsuccessful applicants to see how AB can still enable the project. 9) At this stage any persons (including ArtCom members) that have applied for a Creative Grant are excluded from the allocation of funds phase.